Rundschau systems have an enviable reputation for being logical and extremely well engineered. 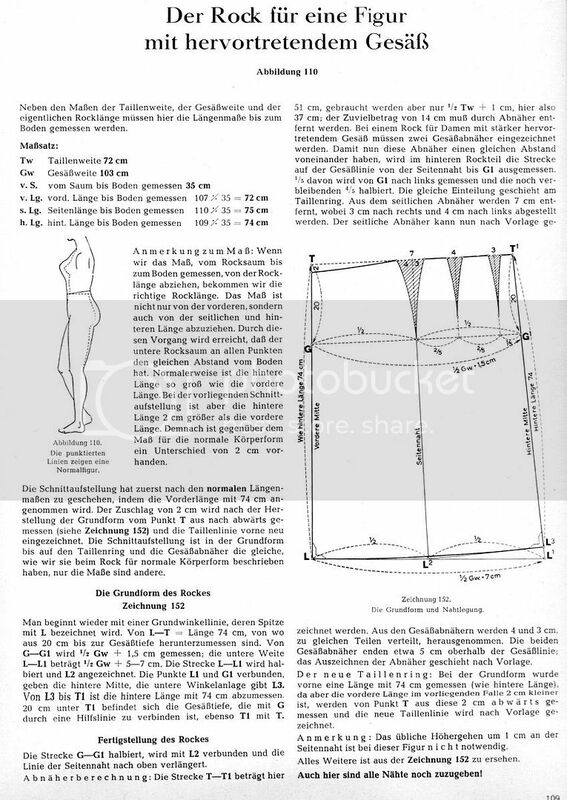 Here is the basic system for drafting a sloper taken from the 16th edition of their book on cutting for ladies garments (1960s). It is vital to ensure that the measuring tape is always perfectly vertical when taking the measures. All measures are taken from either lower edge of the waistband. It is also possible to measure from the top of the waistband but if this is done all the measures must be consistently taken in the same way. These additional balance measures are not always necessary but are useful for those with more curvature at the hip or seat. On a proportionate figure the front and back lengths are the same. If the seat is prominent then the back length will be longer. If the seat particular prominent the back length may end up longer than the side length. It should be noted that there are forms of disproportion of the hip that these balance measures will not pick up on and it is here that careful observation of the figure with the eye is still important. The basic straight skirt has the same width in the hem as it does at the seat. When worn, straight skirt always appears narrow at hem than at the top. If a slimmer effect is desired a little taper can be added to the side seam at the hem, as is shown in the second diagram below in dashed lines at point L2. Such a tapered style should only be adopted on clients with a fairly similar measures at the waist and seat. It is preferable on women with a prominent seat or thighs to have an increase in the ease at hem. Measure out the front skirt length in a vertical direction from T to L. Then measure the depth of seat from T to G, an average distance of 20 cm. Naturally, the direct depth of seat, measured from the waist to the greatest prominence of seat can also be applied. On the seat line measure out the half width of seat with an addition of 1-2 cm ease from G-G1. The centre back seam is drawn in on a right angle to the seat line, in other words parallel to the centre front line. The side seam can be placed half way between G to G1. On the side, the point T2 is displaced upwards by that amount that side seam length exceeds the front seam. To determine the amount of excess there is in the waistline measure the entire length from T-T1. Deduct the half waist width + 1cm from this measure. In this case, the excess is 15 cm. This excess is distributed according to the figure and her seat shape. Here, 9cm of excess needs to be accounted for at the side seam, plus a further 4 cm for the darts in the back panel, and 2 cm for a small dart the front panel. However, if there is prominent roundness of hip, but the seat is flat, then 10-11 cm can be removed, with only 2-3 cm removed from the back panel dart. If the seat is very prominent, the back panel dart can be made larger or an additional second dart can be added the back panel. The shape and length of the darts is dependent of the seat and hip shape of the client. At the centre back, a seam can be deployed that receives a slit at the bottom. Alternatively a kick pleat or an inverted pleat can be deployed there. The draft is nett without seams. All seams and inlays have yet to be allowed for. First a proportionate pattern is drafted with a front length measure of 73 cm. The draft is the same including the waistband and the darts, only the measures are different. The square is started off at L.
The point L1 is related to the width of seat. The distance measured along the seat line between the centre front and centre rear is halved and joined with L2. Draw in the front line. The width at the waist should be between 10-11 cm more and the hem 1.5-2 cm more. The new waist line. In the proportionate base model the length at previously was 73 cm (rear length). However, as the front length in this case is 2cm longer this additional length is place at point T, and the new waist line is drawn in as shown in the diagram. Calculation of the darts. The distance T-T1 is in this case 60.5 cm. However, only 1/2 Tw + 1 cm is required, which in this case would be 52 cm. The excess that needs to be accounted for with darts is 8.5 cm. From the hip dart 3.5 cm is removed, from the seat dart 2.5 cm, and from the dart at the front another 2.5 cm. As this skirt has a dart at both the front and back sections, the side seams at the hip dart get the same amount of roundness over the left and right sides. The darts are completed overall as per the diagram. Comment: it is not necessary on this figure for the side seam to be raised up about a centimetre. If a proportionate draft was used for this figure the following fitting errors would be observed. The skirt would be pushed upwards at the front by the corpulence, creating untidiness at the bottom. At the back the hem would sit against the legs. The alteration to the base pattern is so carried out that the skirt is lifted up and away somewhat at the back, and the length at back corrected accordingly. The skirt thereby regains its clean fall. The correct skirt length can be found by subtracting the distance of hem to floor from the skirt length to the floor. This calculation is done for the front, side and back lengths. In this way, the length of the hem to the floor becomes the same for all sides. On a proportionate figure, the back length as long as the front length. However, in this draft the back length is 2 cm longer than the front length. Start the skirt draft out for a standard proportionate draft. The front length is made 74 cm. The addition of the extra 2 cm is made by measuring backwards of point T. The waistline is then redraw accordingly. The draft is the same as the proportionate draft at the waistline and seat dart, only the measures are different. Start with the square at point L.
From L-T lenght = 74 cm. Calculation of the darts. The length T-T1 is 51 cm in this case. Of this, only 1/2 Tw + 1 cm is needed ie 37 cm. The excess length of 14 cm must be removed by darts. On this draft for a figure with prominent seat, two seat darts must be drawn in. So that these darts have the same distance from one another, the distance along the seatline from the side seam to G1 is measured. 1/5th of this is placed at the left of G1. The remaining 4/5th is halved as shown on the diagram. The same divisions occur at the waistline. From the side seam 7 cm is taken out, of which 3 cm is at the right and 4 cm at the right. The side seam is completed as per the diagram. From the seat dart 4 and 3 cm are again taken out. The two seam darts end about 5 cm above the seatline. The drawing in of the darts is as per the diagram. The new waistline. On the proportionate base draft a length of 74 cm is measured out (like the back length). However, the front length in this case is made 2 cm shorter. 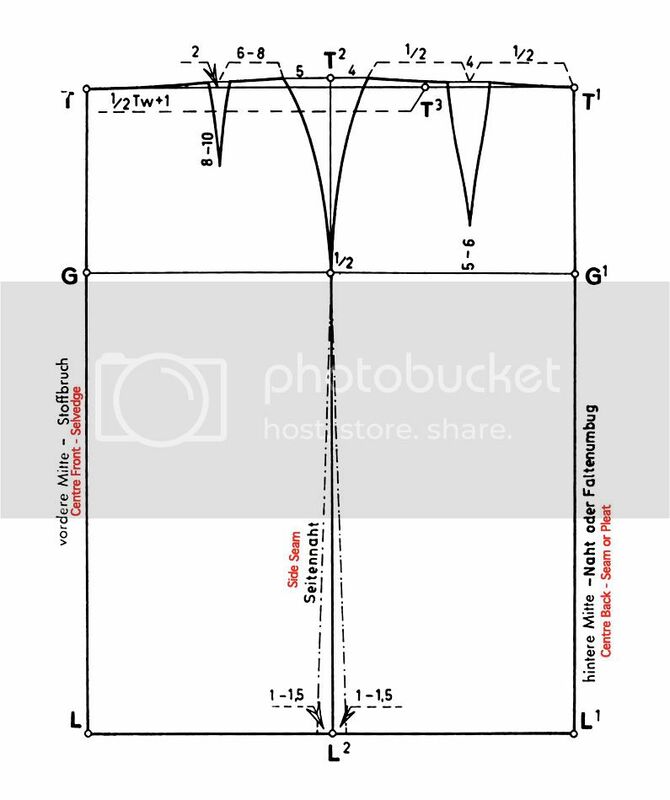 The lower point is found by measuring downwards 2 cm from T. The new waistline is completed as per the diagram. Remarks: the usual 1 cm elevation of side seam is not necessary on this figure. Everything else can be found in the diagram. The draft is nett without seams. Seams are yet to be allowed for. Comments on the measurements. When you compare the waist measure to the seat measure, you can see that there is a significant different. On a proportionate figure, the seat measure is at most 28 cm larger than the waist measure, but here it is 32 cm. On a proportionate figure once again the side length only 1.5 cm longer than the front length, whereas in this example it is 3 cm longer. During the drafting of the skirt care must be taken to place the additional width where the figure needs it. In this case, it is desirable to place a short hip dart on the run of the foreparts. Otherwise the draft is the same as the normal draft up the draft of the waist. The roundness add by the hip dart may be equally strong on both left and right side, as this skirt has a dart in both front and back sections. The front dart is placed as follows: from the top of the side seam measure out 8 cm to the left (see diagram), and there draw a construction line to the depth of seat. The 2.5 cm dart is taken out in equal measure from the left and right sides. In order to keep the lengths of both darts equal, it is necessary to measure out the dart line, the lengths then determined and then waist line drawn in. It is vital to ensure that the measuring tape is perfectly vertical when taking the measures. I draft my patterns using the Rundschau system and find the lead measurements tape a great help, sometimes your arms are just not long enough and using this tape you do not need to kneel down.Just putting the lead part on the ground and measure the length towards the waist, deduct the amount for the finished length, from the ground floor towards the desired length, at center front, left side, right side and center back length. It helps to put a piece of elastic or a piece of string around the waist to determine where the natural waist is on the body of a client. You can order this 2 meter metric tape from http://www.muellerso...hau-verlag,,34/ I know it is expensive but so worthwhile and it will last forever. She kindly sent me one and they are wonderful tools. 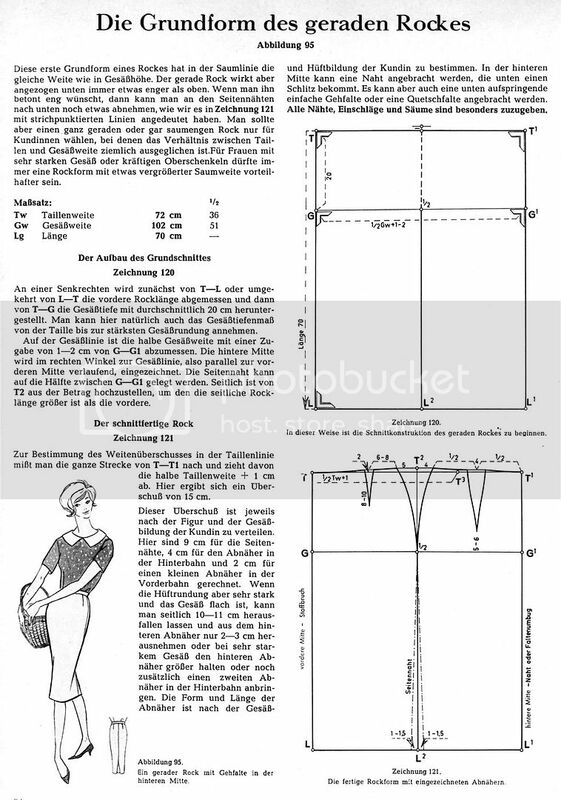 The waist to floor measurements are useful to correct the draft but must be used in conjunction with a determination of any existing waistline tilt. You can add in the seam allowances as you go, such as, waist is 9", add in, plus 1/2". And/or, ease allowances you can add seam allowances in there. That is how the Britts do it, figureing out when and where, so they are all there where you want them. The German methods is like adding an inlay. Where do Germans thread mark? Those threads would be in the way if that is where you sew. At the above skirt draft the wearing ease is included for the waist and hip, 1/2 WT =1/2 waist plus 1 cm and for the hip wide 1/2 GW = 1/2 hip wide plus 1-2 cm. Just like for any other Rundschau Damen/ Woman draft the wearing ease is always included in the draft. I find it much easier that are no seam allowances added in ladies patterns. I create so many different styles from one basic pattern - panels, rotating the bust dart to several places, yokes a.s.o. - I must not remember about S.A.- there are none. I have to add all of them later when your pattern design is finished. There are some rules how big they are at side seam or armhole or shoulder. And as Els stated the ease is every time included in the draft. 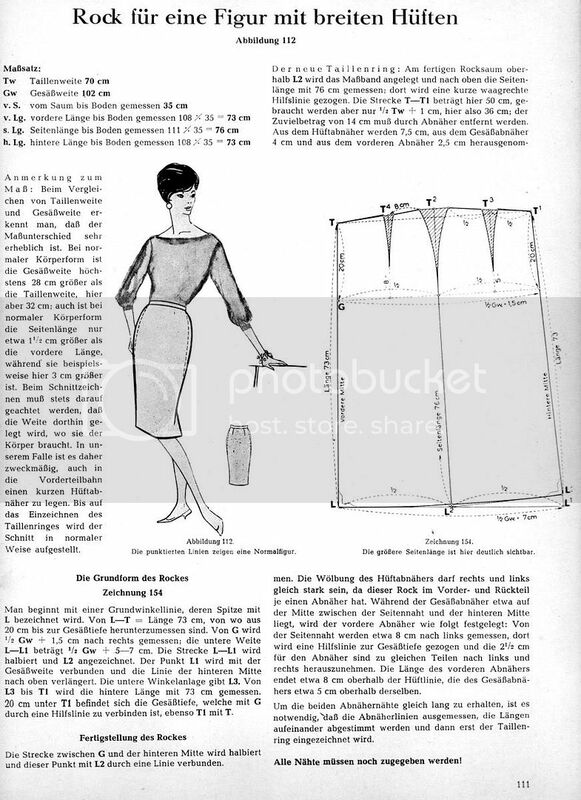 So if I draft a model out of Damenrundschau they tell me from which basic pattern (examples: fitted dress from Nov. 1992 or loose Jacket Jan 1996) the new model was created. there are two methods to find L3 either applied measures or Squaring. Using applied measures, simply measure down T1 to L1 the back length of skirt. Using the method as given (squaring), line up the small arm of your square flush to line T1 to L1, now slide it up and down until the long arm rests on L2, draw line complete curve as shown. Edited by J. Maclochlainn, 16 August 2010 - 02:05 AM. Please note that the first post in this thread has been updated and improved. More improvements are to follow (more detailed and revised English translation). Next to follow are a draft for a figure with wide hips and another one for a figure with asymmetrical hip shapes. Thanks for everyone who has pointed out errors in the translation or ambiguities in the text. These have been corrected. To try to avoid making this thread confusing for future readers, I am deleting the discussion on these issues after correcting some of these problems. However, this is not to say I don't appreciate constructive feedback as you have helped to refine this thread greatly. Please keep these coming!!! I have also deleted some old chit chat posts from last year (both mine and from others) that contributed to this thread spilling over into page two for a while. Chatter from years ago tends to look a bit stale. This is to make the thread easier to read as a reference thread. Eventually this thread will mature into an Article. Els, thank you for the link, this is what I was seeking for. Does anybody know a place in the USA where I can get a similar tape? Or does those engineering scientific tool, always and only come from Germany? 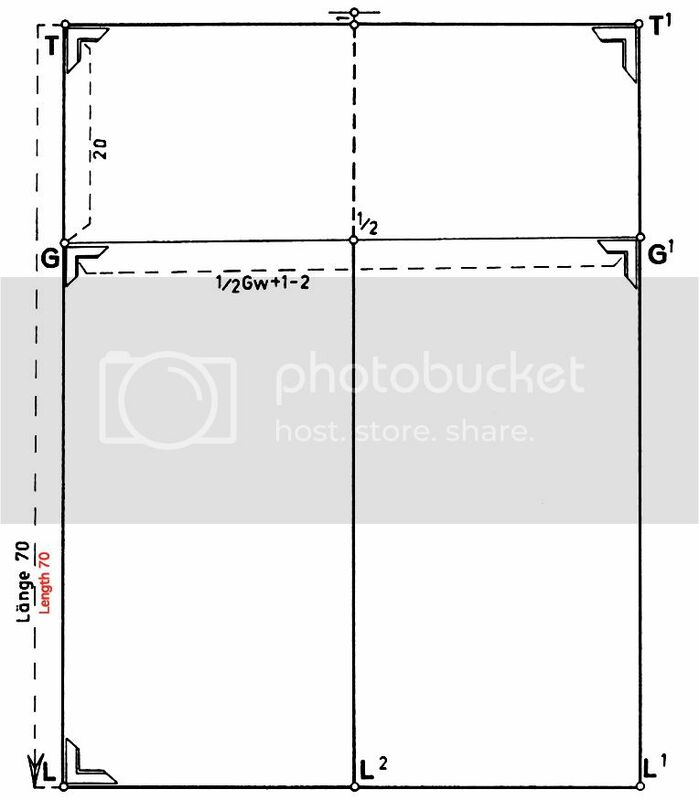 This tool is inevitable for producing correct measurements for men and women. For the skirts just take those measurements along all 4 sites and any prominent will be beaten up without thinking. You only need to adjust the darts for big butts or small butts. The rest does the skirt rounder. I have been meaning for ages and ages to add the next sections to this thread - which also needs pinning. The next part about cutting a skirt for a figure with a stout waist and a flat seat. This post is a bit off topic and can be deleted then. German engineering already favorites cutting systems without seams since the 1965 I think. 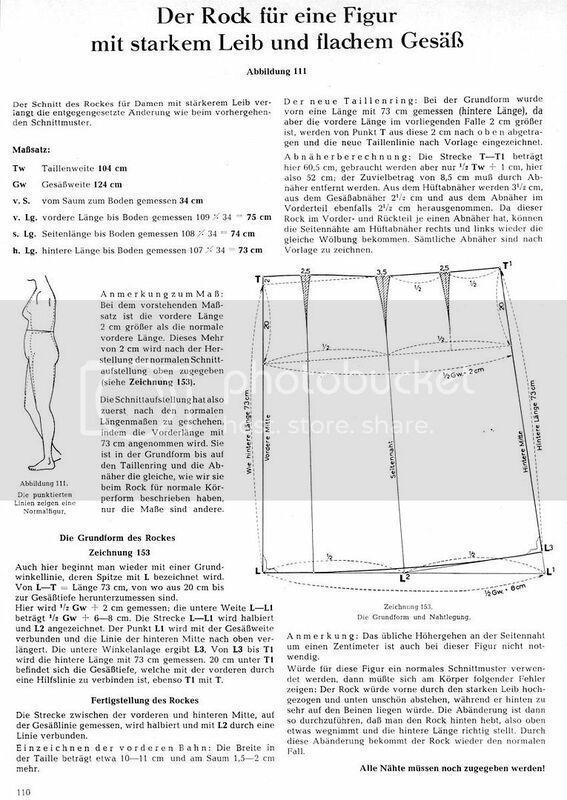 German men tailor were discussing the advantages at that time and published drafts. The advantage was to draft in a much higher accurateness like 5mm around the body, another advantage were the inlays to add evenly on both sides on the seams as to add seams only on one side of the seams is completely illogical and geometric mathematic rubbish when the inlays later be needed. German engineering drafting was light years ahead of the ones in the rest of the world. I draft in both systems (with/without seams) at the same time as I redeveloped the Czujewicz and Hans Mayer systems with information technology to an accurateness of mathematical x = x.
I just ordered my lead tape at Mueller&Sohn. The most expensive tape I ever bought. But as my master tailor once told me when I complained about a Buegelbock to be 90DM he told me you can't iron on the money bills you need that Buegelbock. So I can't take measurements with a stick and bought the lead tape, now there are only 8 available. What does a customer think when you fiddle around with some unprofessional measurement appliances? All drafts have been merged into the opening post and this has been further updated with the addition of a draft for wide hips. I notice these skirt drafts have equal back and fronts? I have always displaced the sideseam giving more on the back and less on the front, this helps with the placement of the darts and also the shape of the sideseam at the waistline. yeah but doesn't advancing the seam give the illusion of a bigger back side? Edited by J. Maclochlainn, 25 August 2010 - 06:47 AM. Surprisingly all the drafts for skirts are basically symmetrical, although I find it more shape conform to reduce the fronts like Mansie does (relocate the side seam). For the flat seated it's a must to give that visual balance, for the round seated it's a physical necessity for the same reason. FWIW, I have seen Italian skirt drafts which do not add any ease to it. What does that say about Italian women?